All images © Stewart Attwood Photography 2018. All other rights are reserved. Use in any other context is expressly prohibited without prior permission. No Syndication Permitted. Scotmid showed true community spirit to put a smile on eight-year-old Tom Megaughin-Helder’s face – getting him a replacement bike after his original one was stolen outside his home. Tom’s plight was highlighted in a story which appeared in the Edinburgh Evening News at the end of May and staff at the Scotmid store on Easter Road, where his parents shop regularly, flagged up the situation and the community convenience retailer were keen to put it right. 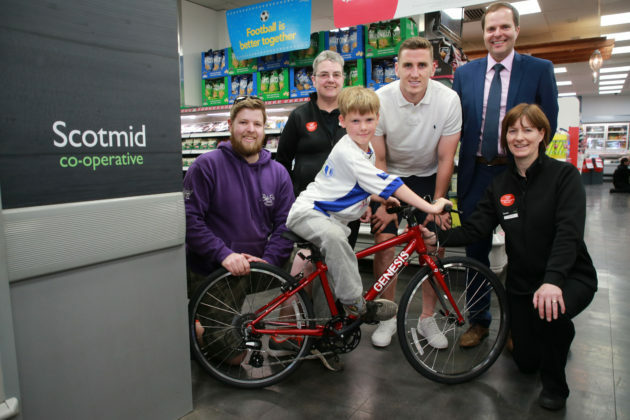 Edinburgh-based Bike Craft stepped in to help source the right replacement and, after learning that Tom was a big football fan, Hibernian defender Paul Hanlon was invited along to the store to present him with his new bike. A Scotmid Co-operative spokesperson said: “As soon as we were made aware of the situation, we wanted to put it right and give Tom a replacement bike for the one that was stolen. “Fortunately with the help of our friends at Bike Craft we managed to get a replacement, which we hope Tom will love and seeing the smile on his face makes it all worthwhile. “Tom’s parents regularly shop in our Easter Road store – our staff know them really well and going the extra mile to right this wrong was a no-brainer for us. “We pride ourselves on being at the very heart of the local community – as a co-operative, that is our core purpose and we understand that goodwill gestures like this can go a really long way. “When we initially made contact about the situation, Tom’s Mum Annette told us he was also a big football fan, so we thought it would make it even more special if Hibs defender Paul Hanlon presented the bike to him. “It was brilliant that Paul agreed to give up his spare time to come through, but typical of him – he is a model professional and a fantastic ambassador for Hibernian Football Club. Image (left to right): Bike Craft’s Cameron Allan, Scotmid Easter Road store staff member Pauline Ward, Tom Megaughin-Helder, Hibernian’s Paul Hanlon, Scotmid Regional Business Manager Allan Robertson and Scotmid Easter Road store staff member Evelyn Marshall.